Tharuni under Girls Alliance Advocacy Programme conducted Interface Meeting with Line Departments of Warangal District on 28-02-2017.District Collector ,Warangal Smt. Amrapali I.A. S; was the Chief Guest, who told the Line Department Officials to take action immediately as soon as they come to know that Child Marriage or Child Abuse cases are reported to them.No such cases against the Children should take place in the district, she stated.Dr. 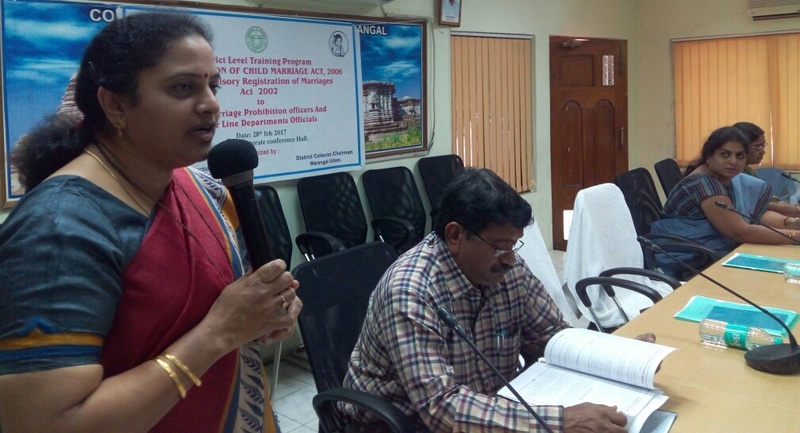 Mamatha Raghuveer, Founder Tharuni and the Local Advocate explained the Legal enactments against Child Marriage, child Labour and POCSO .Women Welfare and Child Development Department Officials,and District Officials of all Departments participated in the Workshop.